In one of the principal streets of Allegheny, Pa., stands the heroic bronze statue of a man in the simple garb of an American of fifty years ago. Almost within sight is a magnificent structure whose towers rise far above all the adjacent buildings. The statue is that of Colonel Anderson and was reared by Mr. Andrew Carnegie in grateful apprecia­tion of his kindness in opening his library of four hundred books to the young men of the town, which enabled Mr. Carnegie, when a telegraph messenger boy, to obtain access to literature. That kindness made the boy declare that if he became rich he would devote his wealth to the building of libraries for people who could not afford to buy books. The splendid building was the first fulfillment in America of that promise of a fruitful gen­erosity which now extends around the world. In nearly every English-speaking country to-day there is a Carnegie free public library. Altogether there are 1,352. During every hour of every day some of these libraries are open and in use. In New Zealand they enlighten the Maori; in the crowded East Side of New York City they uplift a congested foreign population; in Ireland they influence a struggling race. Without regard to creed or color, they have everywhere taught the value of high intellectual ideals. They have placed (or will place, when the buildings planned are erected) free reading within the reach of 25,000,000 people, and they repre­sent a total benefaction of more than $40,000,000. No individual has ever con­tributed so much to a single cause or touched so many people. It is the most remarkable public service in the history of philanthropy, and its conduct is as unusual as the person­ality behind it. Almost any day you may read in the papers that Mr. Carnegie has presented some town with a sum of money to build a free public library. The conditions imposed are that the community furnish a site and pro­vide for an annual fund by taxation to main­tain the institution. This simple announce­ment means that the whole machinery of a wonderful organization has been set in motion. When Mr. Carnegie was in business he dom­inated the steel industry of the United States by the application of methods that made him a conspicuous leader of industry. When he started to apply his great fortune to a con­structive activity that appealed to his senti­ment and his enthusiasm, he remained the business man. The result is that the system of giving free libraries is as well organized as the most perfectly conducted commercial establishment in the world. Few people know of the working of this system, yet many millions have been benefited by it. Most wealthy men who make public gifts in a large way have a general office where all that business is transacted, but it is different with Mr. Carnegie. When he is in New York (and that covers six months of every year) the center of activity is at his residence at Fifth Avenue and Ninety-first Street. Within the imposing mansion that overlooks Central Park you will find the records of nearly every Carnegie Library in the world, and what records are not there are at Mr. Carnegie's Scotch home, Skibo Castle, where he goes every summer. The work is con­tinued at Skibo without interruption. Go to the New York house any day and ask Mr. Carnegie's secretary the cost of the public library at Fort Worth, Texas, and he will tell you in two minutes; inquire the progress of the work on the library in Louisville, and you will know almost as quickly. Ask any fact about the building which bears Mr. Carnegie's name in Tasmania, and it would be forth­coming just as soon. The moment you enter the office of Mr. Carnegie's secretary, you feel that you are in a business place. Although inside one of the most palatial residences in New York, it is as different from the home part of the building as if it were down in Wall Street. You hear the click of typewriters; in the center is a long desk littered with papers, and lining two of the walls are files of oak cabinets. Scrut­inize the labels of these cabinets and you will see lines with which every school boy is familiar. Here is a section for "Carnegie Institution"; another bears the card "Organ Gifts"; a third shows “Carnegie Hero Fund"; but there are dozens of sections labeled "Libraries," for it is in these cabinets that the whole inside story of the greatest bene­faction in the world is told. Carefully arranged alphabetically is every document bearing on every Carnegie Library, ranging from the simple, earnest appeal of an obscure clergyman striving for the welfare of his community in Scotland, to the ornate official request of a large municipality for a million dollar gift. Yet both of these applications have gone through the same channel and both have received the same consideration. Any English-speaking community in the world may secure a Carnegie Library by making a formal request and fulfilling the business conditions imposed by. Mr. Carnegie. Suppose in Nebraska a city of 10,000 people is without a public library building, and a public-spirited citizen, hearing of Mr. Car­negie's library gifts, writes to him asking for a sum of money to build a building. It is a part of the free library system that every letter bearing on a library matter shall be considered and answered. The moment the letter is opened by Mr. Carnegie's secretary, it becomes part of the system which has made it possible successfully to handle the work of more than a thousand libraries, often with the negotiations for several hundred going on at the same time. Immediately upon receipt of the request, Mr. Carnegie's secretary sends a blank form to the applicant, whether it be individual or society, provided they give evidence that the community or their officials are with the project, asking that certain questions be answered. These replies aid Mr. Carnegie in the consideration of the gift. There is a whole series of documents carefully prepared and adapted for every local condition, which is furnished to appli­cants. It shows how perfect is the method which Mr. Carnegie has adopted. If the applicant be a college, a more elabor­ate form is sent, asking for specific informa­tion about endowment and for all the facts and figures to show the general and financial condition of the institution. The experience gained in regard to hundreds of institutions enables Mr. Carnegie to find a weak spot in many cases. The request for an elaborate hundred thousand dollar library when a twenty-five thousand dollar structure would be ample, receives little sympathy for the applicant and his case. When these forms have been filled out and returned to Mr. Carnegie, they form a basis for systematic consideration. If the appli­cant be favorably considered and allowance be made for a building, Mr. Carnegie requires the council or local governing body of the community to devote a specific sum yearly (usually to per cent. of the cost of the building) for the maintenance of the library. Mr. Carnegie does not provide plans, but he likes to have them submitted for approval. He does not interfere with the local author­ities in choosing a site. Believing in home rule, as he does, a site which is satisfactory to the people and their representatives is satisfactory to him. When all the requirements imposed by Mr. Carnegie have been met, and when the building plans have been sent on and approved, the Library Commissioners receive intimation that Mr. Carnegie's cashier at the Home Trust Company, Hoboken, N. J., will honor their calls to the full amount of the gift. All requisitions for library money must be made by the officers appointed by law to take charge of the library in the community, and must be certified by the architect in charge of the work. A Carnegie Library building must be used exclusively for library purposes. It must be built on a site furnished by the community or by gift from some benevolent citizen. Al­though his name, by the common and spon­taneous consent of a grateful people, adorns a thousand buildings all over the world, he has never made a request that this be done. How does Mr. Carnegie know the amount of money to give to a community? The information that he receives on the blank forms largely determines this. It has been his custom to give about. $2 for every inhabitant, according to the latest Federal census. A town of 10,000 people usually gets $20,000. It is astonishing how towns grow according to applicants for libraries. Mr. Carnegie's secretary says that if applicants for libraries are to be believed, the next census of the United States will show 150,000,000 people, at least. A claim of a 25 per cent increase since the Federal census of 1900 is considered comparatively modest. But Mr. Carnegie does not depend alone on the information he receives in this way. He is a careful reader of the newspapers; he keeps in touch with intellectual activities; he learns the needs of communities. Sometimes the original amount of the bequest has to be increased to cover the over-ambitious plans of those in charge, although the data at Mr. Carnegie's command enable him to estimate closely the needs (not the desires) of a com­munity. Sometimes cities enlarge the scope of their work. Louisville, for example, orig­inally received a gift of $250,000. The Library Commissioners there decided to establish branch libraries, and asked Mr. Carnegie for an additional $200,000, which he gave. Branch libraries, which bring books close to the people, appeal more to Mr. Carnegie than large central buildings, in which some­thing ornate and monumental is more likely to be the object than a storehouse for books and facilities for their being read. NEW YORK, January 26th, 1904. MY DEAR MR. GAY. —Yours of the 11th received. You have broken the record this morning by your note. In all my experience, having provided funds for about thirteen hundred and fifty lib­raries, I have never had a Chairman of a Building Committee report a surplus and I have very often had to meet a deficit. Please hand over the surplus to the Library to purchase an encyclopedia or some standard work thought most useful. In short, make a disposition of it as you think best, feeling that I can trust the chairman of a committee who builds a library, with all its unexpected demands, for a stated sum, and shows a balance at the end. WILL F. GAY, Esq., ANDREW CARNEGIE. High School Building, Mt. Vernon, N. Y.
P. S.— You must have a model architect.—A. C.
Mr. Carnegie's library - giving has never taken the form of charity. He has never bestowed money for this purpose except where the people have shown their desire to support a library. Mr. Carnegie's rule in the distribution of millions of dollars has been "Equal sympathy for all; special favors for none." This rule has never been broken in the long story of his gifts. His is perhaps the only great organized public service with iron-clad rules which affect hamlet and metropolis alike. Mr. Carnegie believes in home rule in all matters pertaining to the location and conduct of buildings. But sometimes com­plications arise, as in the case of a city through which a river flows. Then there is a contro­versy as to which side shall have the library. This happened at Waterloo, Iowa. The city met the usual requirement for taxation, but a discussion arose between two factions representing the people on both sides of the river. Neither side would give in. Finally a com­promise was affected, by which it was agreed to build the library in the middle of the river. When Mr. Carnegie heard of this, he good-naturedly decided to end the controversy by giving money for a library on each side of the river. The whole vast library business is done by correspondence. Mr. Carnegie discourages personal visits. Out of 1,352 libraries which he has given, scarcely fifty have been secured through personal contact. He does not like to be talked into giving, and insists that proper statements be submitted in writing; otherwise his time would not be his own. He carefully studies these statements at appointed times. Fifty pounds of dried fish. Twenty pair of knitted socks. Four weeks of service by laborers. They got a fund for books. But no action was more characteristic than that of the herring fishermen and the other inhabitants of Shieldaig, Sutherland, Scot­land. This is a small town on the storm-swept coast. The library secretary wrote to Mr. Carnegie, asking for money for books and magazines, and he received the usual reply that Mr. Carnegie never makes any kind of library gift without some action of the people of the community showing a desire to sup­port it. In this case it was suggested that a subscription list be started. This was done, every inhabitant of the village contributing. Frequently the contribution was two pence. The people raised two pounds seventeen shillings and fourteen pence and Mr. Carnegie contributed an equal sum. It is in the United States, however, that there has been the greatest activity. Only two states - Rhode Island and Arkansas - are without Carnegie Library buildings. Rhode Island is amply provided with libraries, and Arkansas has no library legislation which will permit communities to tax the people. Illinois has sixty cities and towns with sixty libraries, yet New York, with only forty towns with libraries, has 120 such institu­tions. This is due to the establishment of many branch libraries in New York City with Mr. Carnegie's gift of $5,200,000. The Carnegie Libraries in Illinois are more evenly distributed than in any other State in the Union, because there is only one library in a town. 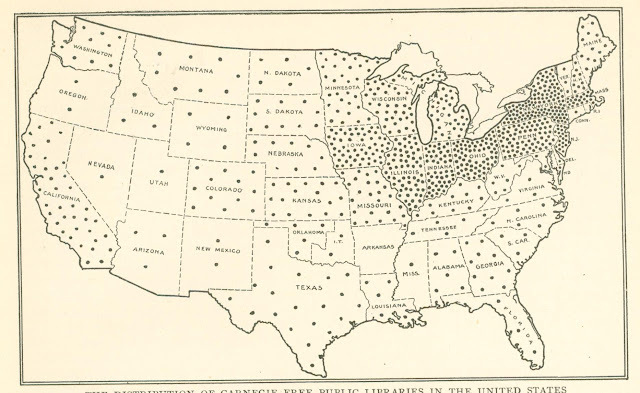 A table of Carnegie Libraries of the United States shows a significant growth in the newer States and particularly in the West. For example, Iowa has fifty-four towns with Carnegie Libraries. California has thirty-six towns with forty-six libraries. Texas has twenty. There are two in Indian Terri­tory, three in Arizona and two in New Mexico. Kansas has sixteen and Nebraska has nine. Illinois leads the Central States, while Indiana is second with forty-nine towns with forty-nine libraries, again showing one library to a town and a wide distribution of the buildings. Massachusetts has only twenty-one Carnegie Libraries, because nearly every town had a library when Mr. Carnegie began his work of establishing them. Pennsylvania has thirty-four towns with seventy library buildings. This State was the first in which a Carnegie Library building was erected, for it was at Allegheny that Mr. Carnegie reared the magnificent building commemorating the kindness of Colonel Anderson. This place and Pittsburg witnessed his great business achievements. At Brad­dock, Homestead, and Duquesne, where his great steel works employed thousands of people, Mr. Carnegie built libraries for the workmen. He supplemented the library buildings with gymnasiums and meeting places, but it was the library work that began this welfare work for the people who served. The largest percent of the population in any community served by a Carnegie Library is the District of Columbia, where the Wash-ton building supplies 78.4 per cent of the people with books. The total number of library buildings built and promised by Mr. Carnegie in the United States is 671. When all are built they will serve 18.9 per cent. of the whole population. They represent a total benefaction of $29,807,980. This includes the promise of $100,000 for a building in Porto Rico. There are no Carnegie Libraries in the Philippines. Architecturally the Carnegie Libraries have had an aesthetic and uplifting influence throughout the whole country. Last summer I was driving through a little town in North Dakota. Ten years before it was a group of houses on a river bank and a stopping place for lumbermen on the way from Canada. That day I drove through well-made streets. The driver stopped the carriage before a low, square, classic-looking building surrounded by trees. "That's our Carnegie Library," he said. "We are mighty proud of it." "Why?" I asked, curious to find out what he would say. "Well," he said, "that building has made everybody else here want a nice building." I had a similar experience in Kansas. In the crowded foreign districts of New York City the Carnegie Free Libraries are making American citizens out of the young boys and girls. I spent an afternoon recently at the free library on Tompkins Square, in the very heart of the Hungarian section. It stands out among the dark, low tenements, giving an aesthetic distinction to the whole community. But it gives more than this. It is not only a place where books are given out and where men, women and chil­dren may come to read where it is bright and light and clean. It has entered into the very life and character of the whole district. Here come the mothers with their stories of suffering and distress to find comfort and sympathy and help from the librarians; here assemble the young men who work all day and study half the night, educating them­selves and eager to rise out of the sordid conditions in which they live. The children come from dirty homes with clean hands. Standing in line to get books, and respecting the rights of the children who have come before them, is giving them a moral discipline. The little ones carry the methods of the school-room to the library, for they raise their hands and say "Teacher" before asking for a book. Many incidents enliven the daily round of these East Side libraries. One day a child came in. "Teacher," she said holding up her hand, "I want to get Lamb's Feet." "Lamb's Feet," said the librarian, "You must be mistaken. There is no such book." But the child insisted that her school teacher had told her to get it. It turned out that she wanted Lamb's Tales. Another child said she wanted a book on woman's sufferings. The librarian gave her a medical book. "That ain't what I want," replied the child. "My mother said it was about votes." She wanted a book on woman suffrage. "A reference is the fellow what sticks up for you." "My sister does not want any more books. She is dead." What is happening at the Tompkins Square Library is happening at the East Broadway Library in the heart of the Ghetto, and at a half dozen other Carnegie Libraries in New York City. Everywhere they are entering inti­mately into the life of the people, broadening them and making them better men and women and children. But it is not alone in the bustling cities and the thriving little towns that the Carnegie Libraries are working for the betterment of the people. Out on the highways and in the remote districts their influence is felt. Take the case of Washington County, Maryland. The county seat is Hagerstown, where Mr. Carnegie built a library. In Maryland the township is not the local governing body. The authority rests with the county government, and the funds for the maintenance of the library were therefore supplied by the county. This aroused some dissatisfaction among the farmers who were far removed from the town and who, while taxed, could not share the benefits of the library. The Commissioners decided to establish a traveling county library, the first in the United States, with stations throughout the district where books could be deposited. The farmers, instead of having to drive to Hagerstown, went to the nearest cross-roads post-office or general stare, where they found the latest books. The books are sent out in cases and renewed at regular intervals. Thus no books are duplicated. There are now fifty-nine such stations. Dur­ing the first year, nearly 3,000 books were distributed. The next year, 5,000 books were in circulation. The interest in these books has led to the establishment of reading-rooms for the farmer boys. Recently the library facilities have been further increased by the establishment of a system of library wagons to carry books to places not accessible by trolley, train or stage. These wagons are equipped with shelves. The drivers will make visits from house to house, thus bring­ing good literature to the very doors of the farmers. This example might be followed with .advantage by many rural communities, especially in the South. In Ireland, the plan of serving rural com­munities is in successful operation. At Rathskeale, a large district, there are six libraries supported by a tax on the whole community. Outside the United States Mr. Carnegie's largest library benefactions have been in England, where he has given and promised $6,372,240. Two hundred and eighty-three English towns have a total of 325 libraries, or will have, when all provided for are erected, serving 20 per cent of the population. The smallest Carnegie Library in the world is on the historic Island of Iona just off the Scotch coast. It is less than fifteen feet long and scarcely as wide. It is on a sea-swept spot, and the walls are of granite and nearly two feet thick. It is used by fishermen. The smallest town in England to adopt the free library act, which enables the towns to tax the people one penny for every pound's worth of property, is Rothwell in Northamp­tonshire. The building used for a library was partially built 300 years ago and never completed. It was intended to be a market place. Canada has received free library gifts approximating $1,000,000. There are forty-nine places with fifty-seven library buildings in the Dominion. Ireland has thirty-one towns with Carnegie Libraries. New Zealand has five, Tasmania and the West Indies have one each. 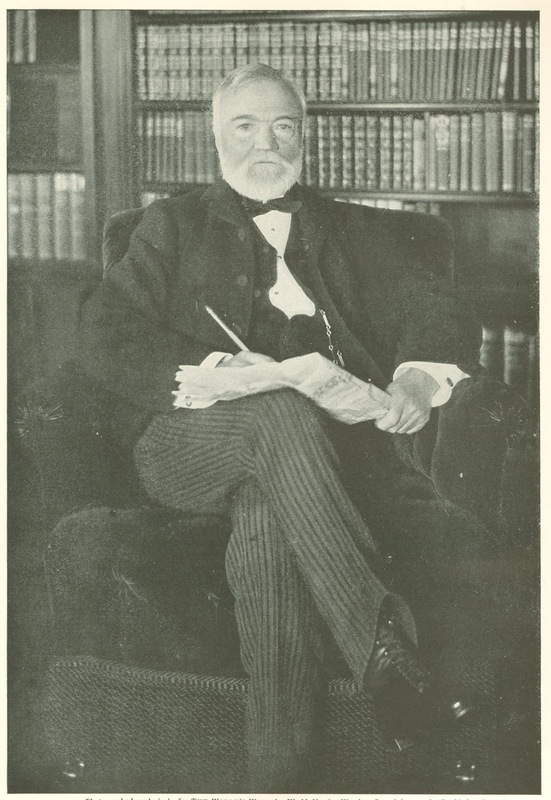 The total amount of money given by Mr. Carnegie for libraries outside the United States is $10,603,540. "Free libraries," he says, "maintained by the people are cradles of democracy; and their spread can never fail to extend and strengthen the democratic idea, the equality of the citizen, the royalty of man. They are emphatically fruits of the true American ideal." The World’s Work Magazine. April 1905.